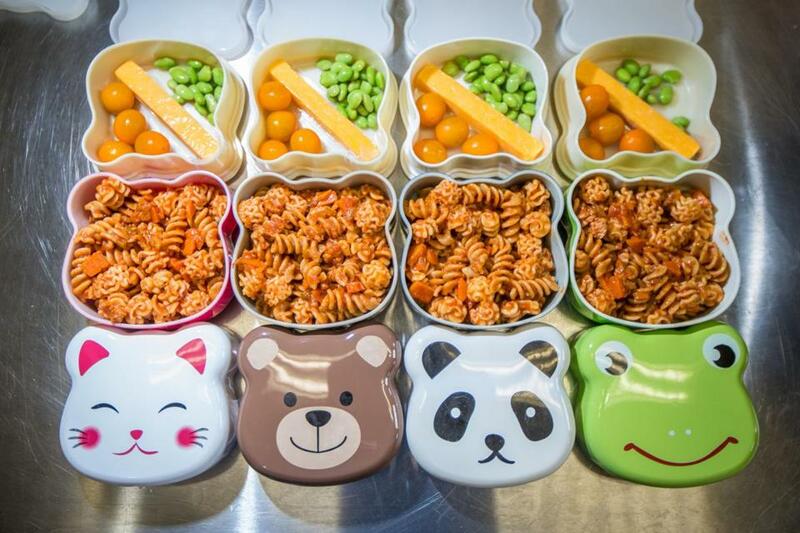 Sproot packages their lunches and snacks for preschoolers in bento boxes with animal faces. Sproot cofounders Nicola Dimond (far left) and Katherine Shamraj in the Melrose commercial kitchen. 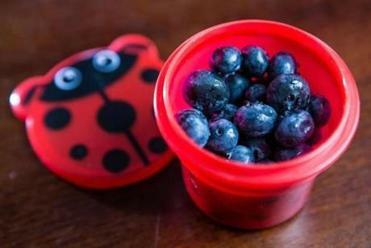 Twice a week, when the Burris sisters sit down to eat at Pine Village Preschool in Jamaica Plain, their lunches arrive in animal-themed bento boxes from the meal delivery service Sproot. Gwen Burris, 3, selects the frog, her sister Clara, 5, prefers the kitten. Their little sister, Ceci, 18 months, just joined them at the school, but is still contemplating which bento to choose. The girls’ parents have signed them up to receive Sproot lunches and snacks at school and when the girls open the frog or kitten, they might find turkey-kale meatballs or an allergen-free sunbutter and blueberry jelly oat pancake sandwich. Snacks run the gamut from blueberry spinach oat bites to slices of banana-cauliflower bread or Parmesan-roasted chickpea trail mix. 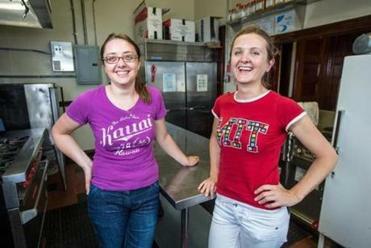 Sproot cofounders, Nicola Dimond, 38, and Katherine Shamraj, 37, who met as business graduate students at Massachusetts Institute of Technology, work alongside their kitchen staff at Corinthian Hall in Melrose to cook and pack meals each morning, then send parents a daily e-mail with a menu and photo of what their little ones are going to get. The cost for five meals is $5.95 to $19.95 a week. About half the students at Pine Village eat meals from Sproot. Dimond or Shamraj deliver them in the plastic bento boxes in a large cooler with each child’s name. The previous day’s boxes are picked up to be cleaned and refilled for another delivery. Darren Burris, a teacher at a Dorchester charter school, and his wife, Heather, a neonatologist at Beth Israel Deaconess Medical Center, subscribe to the service to make sure their girls are getting healthy food and to make weekday mornings at home less stressful. “Sproot helps us manage our work-life balance . . . by providing the kinds of lunches we want to be making, but can’t while we are rushing around preparing for our own work days,” Darren Burris says. A snack pack by Sproot, containing blueberries. Sproot focuses on filling each bento with nutrient-dense foods, so whatever a picky preschooler eats, it’s a balanced meal. “We took the USDA database and built a spreadsheet that lets us input ingredients in order to calculate the nutrition profile for each recipe,” explains Dimond. Their most recent success is “taking over” pizza day, a challenge on two fronts: getting schools to rethink the meal, and kids to switch from what they know as traditional pizza. Students at Sproot schools sit down to mini-pizzas with protein-packed lentils in the sauce atop a whole-grain crust. And yes, the preschoolers are eating these meals. If they weren’t, the items would be pulled from the rotation. Sproot encourages feedback; untouched food isn’t good for the company or for the children. “This is the first time I ever worked with a service provider that is so interested in what I think,” says Darren Burris. Gillian O’Callaghan can be reached at gillian.ocallaghan@globe.com.